Upton Sinclair was a journalist who focused on exposing corruption in government and business. 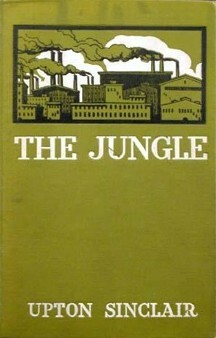 In The Jungle, Sinclair exposes the heinous conditions in Chicago’s meatpacking district. This book led to the Food and Drug Administration being formed along with several others bills being passed. More than anything this book taught me gratitude. The working and living conditions that these people had to endure is horrific and every time I think of this book I think of how lucky I am. This entry was posted in Books and tagged Classic, Fiction, Upton Sinclair on February 3, 2015 by Blas.